1. Fed chair confirmation hearing: President Trump's nominee to lead the Federal Reserve, Jerome Powell, goes before the Senate Banking committee on Tuesday. Powell would be the first investment banker to lead the Fed, as well as the first non-economist to take the helm in decades. Analysts don't expect Powell to make any major shifts in monetary policy, but he may loosen some regulations set in place after the financial crisis. The confirmation process is expected to be smooth by Washington standards. 2. Oil down: U.S. crude futures added to their weekly losses, sliding another 0.9% on Tuesday. TransCanada (TRP) said its Keystone Pipeline will resume deliveries on Tuesday following a disruption caused by a leak. The pipeline is a key artery that carries crude into the United States from Alberta. Investors are likely to look ahead to an OPEC meeting scheduled for Thursday. The key question is whether the cartel and allies including Russia will extend production cuts beyond March. It's been a year since the initial production cut agreement, and there are signs that the global oil glut is disappearing. 3. British banks: The Bank of England has given the country's banks a clean bill of health in new stress tests. The central bank said that Britain's banking sector is "resilient" and could "support the real economy through a disorderly Brexit." European markets opened mostly higher, while Asian markets ended their session mixed. 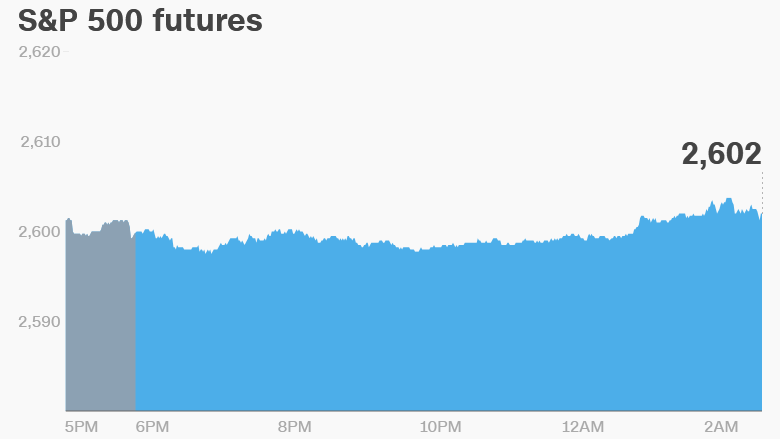 U.S. markets were little changed on Monday, hovering near record highs. The Dow Jones industrial average added 0.1%, while the Nasdaq shed 0.2%. The S&P 500 was flat. 5. Stock market movers: Shares in Toray Industries (TRYIF) dropped as much as 5% after it become the latest Japanese company to be embroiled in scandal. The manufacturer admitted that one of its subsidiaries had falsified product test data. Reliance Communications declined as much as 9% in Mumbai after media reports raised the prospect of insolvency. The company is controlled by business magnate Anil Ambani. Shares in Airbus (EADSF) declined 0.2% after the company confirmed its offices had been raided by the French police in relation to a deal in Kazakhstan. 6. Earnings and economics: Christopher & Banks (CBK) will release earnings before the open. The National Retail Federation will release spending data from Thanksgiving, Black Friday and Cyber Monday.